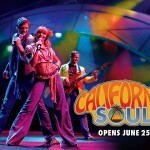 Home > News > California Soul Opens on Friday, June 25 – Right On! California Soul Opens on Friday, June 25 – Right On! If you love the sounds of the 60’s and 70’s, and the “good vibrations” made famous by the west coast bands like The Beach Boys, The Grateful Dead, The Doobie Brothers, and The Eagles, then slip on your huarache sandals and gas up the woody – California Soul, is cruisin’ into town in just a few days!!! Get your tickets now for a full dose of Peace, Love & Understanding, when AMT opens its far out tribute to the hot sounds and cool vibes of California-bred music. It’s a gas, man!